Have you ever heard that “we teach the things we really need to learn”? I’m doing a life class with a group of friends. Brene Brown (famous, amazing author) is our teacher. I wish Brene was sitting in with us, that would be awesome, but since that isn’t an option, we watch her videos and do her assignments. We just had our first get together last week. It was awesome! She mentioned “we teach the things we really need to learn” and it got me thinking about so much of what I blog about. I often use this blog to motivate me to be better and get things done around my house. Writing stuff for you helps me so much! Like last week when I used the Mini De-Clutter Challenge to kick some junk to the curb! Today I want to talk about keeping our cars clean. You probably know by now that I have four kids. FOUR KIDS!!!! And they are still pretty little: 8, 8, 6, and 1. And there are days we cannot avoid eating in the car. On the day the girls have dance, they have soccer almost immediately after, so I try to pack a dinner for them to eat on the way. I love our crazy, fun life, but it gets messy, especially messy for the car. Here are the things I’ve tried that help me keep it reasonable. We aren’t perfect at it, but it really is so much more fun to drive around in a reasonably clean car/ minivan. Make a habit of each person removing personal items every time they leave the car. This one requires lots and lots of reminders from me. It probably only happens 20% of the time I don’t actually say the words “grab all your stuff out of the car, please”. And then, even with the reminder, it only happens 80%. Twenty or eighty percent is better than zero percent! Make a garbage available in the car. Empty garbage regularly to avoid smell. Trust me on this. Don’t keep extra junk in the car. Keep items meant to stay in the car down to the bare minimum, like emergency supplies and sunglasses. Kids don’t need to be constantly entertained in a vehicle. Looking out the window and/or conversation is a perfectly acceptable vehicle activity! Clean the car on a regular basis. During the winter I drive my car right through the car wash and vacuum it out right there, and then I try to do it at home with the kids in the summer. Here are my kids cleaning the inside of the car with my favorite Shaklee cleaner, Basic H. I honestly don’t know how anyone lives without this stuff! It is perfectly safe for my kids to use and even accidentally spray in each others eyes (not that I’d recommend trying that on purpose, I just maybe know someone that did that … like know really really well). Buy Basic H from my shop HERE. 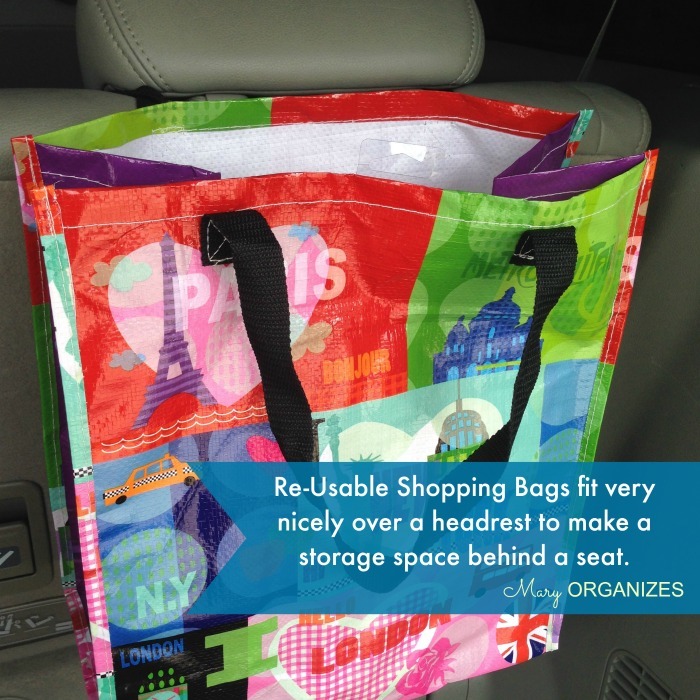 Did you know that those cute re-usable shopping bags fit really well pulled over headrests? They make a great garbage and container for emergency supplies. Writing out this blog post is simultaneously reminding me of all these things. And I’m going to keep trying to keep our car clean. But if it isn’t always perfectly clean, that’s not only probable, but okay too. We get credit for trying! Mini Declutter: Get Rid of NICE THINGS!! Awesome idea to use the reusable shopping bag for a trash can! My trash can in the car is pretty much beyond repair (ripped on both sides) probably from a nine year old cramming too much in it! I am going to put a shopping bag in there today! Thanks for the advice! I wonder where all that debris comes from too. Happens to all cars. Glad you feel motivated! How did it go? We collect and toss the trash every time we gas up. Makes a huge difference! That is a great suggestion, thank you! Now I am going to clean the car! Thank for the motivation! 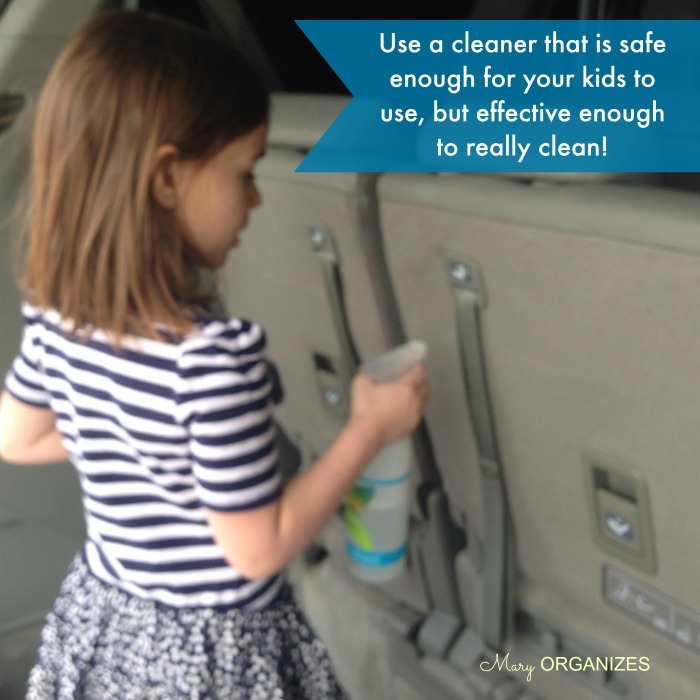 🙂 Any tips for keeping under the carseat clean……gosh that’s always so disgusting! My best tip is to just remember to vacuum/wipe under there when you clean the car so it never gets too awful! That is brilliant! I find it funny that just as I feel like I know all the tricks, the stage passes and I don’t need them anymore. I have a trash bag hanging in the car and STILL find trash in the door handles, etc….Life w/ a teen requires CONSTANT reminders!